Swaledale is one of the most northern dales in the Yorkshire Dales National Park starting to the east of Nine Standards Rigg on the Cumbria-Yorkshire Boundary and descends down to the narrow valley of upper Swaledale at Keld. The limestone dale then runs briefly south before turning east at Thwaite to broaden out as it passes Muker, Gunnerside and Reeth until it ends at Richmond. Swaledale is a stunning valley with many beautiful waterfalls cascading into the River Swale such as Richmond Falls, Kisdon Force, East Gill Force, Catrake Force and Wain Wath Force to name a few. The four latter waterfalls are all very close to Keld. The many large old limestone field barns, there are more than 60 within ½ mile of Muker, and the many scars in the landscape due to the lead mining industry of the 18th and 19th century and the ruined stone mine buildings that are still evident all contribute to the character of this wonderful valley. The River Swale is a major tributary of the River Ure which itself becomes the River Ouse and empties into the North Sea via the Humber Estuary. The River Swale and its valley are home to many types of flora and fauna. Over the last few years the national park has been restoring 495 acres of upland and lowland to bring the traditional hay meadows back to their former glory, as part of the Hay Time Project. The process of not cutting the grass for hay or silage until wild plants have seeded provides a profusion of wild flowers in the spring and summer. There are many public rights of way and open access land for all the family to explore and enjoy in this wonderful dale of Swaledale. Muker is a pretty village in Swaledale in the beautiful Yorkshire Dales. This very small village with stunning views is situated on the banks of Straw Beck which is a tributary of the River Swale and they meet only a short distance away. The village has a post office and shop, a tearoom, a craft shop and cafe and a church. There was once a school which is now the Craft Shop and Gallery and the Tea Shop was originally the vicarage built in 1680 and still has much of its “Olde worlde charm” today. The Church of St Mary the Virgin was built in 1580 replacing a chapel of ease and a graveyard consecrated so that the dead would not have to be transported to Grinton near Reeth. Agriculture was the main industry until the late 18th century when lead mining became more important and hand knitting was also of importance during this period. In the late 19th century with the decline of the mining industry Muker began to see an increasing number of visitors and holiday makers. Muker is now mainly a tourist attraction for walkers with many public footpaths leading into the stunning upper Swaledale. Keld is an attractive village about 3 miles north of Muker and sits on the banks of the River Swale with stunning views of the valley and hills. This very small village has a cafe and a small shop, selling essentials, cold drinks and snacks at Ruskins Campsite. The United Reformed Church and the adjoining Manse sits in the centre of the village and the latter has been restored into a holiday cottage which was completed in 2009 by The Keld Resource Centre. The proceeds go to the centre which is a local charity who are restoring the villages listed buildings they also created the Well-being Garden in the Chapel churchyard in 2010 and the Keld Countryside and Heritage Centre which opened in May 2011. Keld Lodge, a hotel with bar and restaurant and situated on the top road, was the former Youth Hostel and shooting hut which closed in October 2006. Part of the Pennine Way passes by Keld and heads down towards Muker so both villages are a fantastic place for walkers and hikers. Tan Hill Inn the highest pub in England is not far away from Keld. 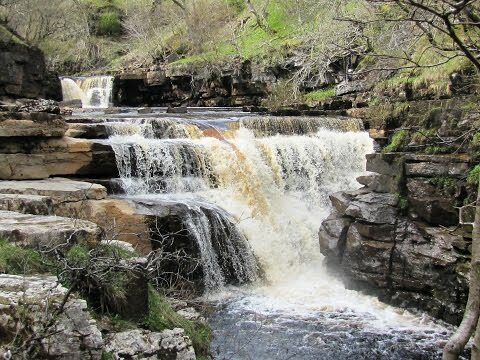 East Gill Force is the closest of four magnificent waterfalls to Keld with an upper falls dropping 4.5 metres and a lower falls made up of a series of stepped cascades that drop 3 metres into the River Swale. The force is very popular with walkers and picnickers. Kisdon Force situated on the River Swale downstream from East Gill Force towards Muker has a drop of 10 metres over two cascades. It is surrounded by Kisdon Force Woods and can be accessed by a small path, sign posted Kisdon Upper Force, going off the Pennine Way. We park in one of the lay-bys at the side of the road next to Straw Beck in Muker and walk through the village passing the farmers Arms and the shop. At the benches on the right we turn left up the no through road just before the church and walk to the right between the buildings. We follow the sign for Gunnerside and keld walking through meadow land on a stone footpath and pass through a series of gates until we come to the river and a sign in front of us. We turn right for Gunnerside cross the bridge over the river and walk up the steps and then turn left following the sign for Keld. We keep to the track with the river on our left. We eventually come to a waterfall and the remains of a mine at Swinner Gill we cross the bridge and head uphill to the trees. We keep following the track through the small wood and round an s-bend at a field barn near to the track. We keep following the track and go through a gate over a bridge and turn left. East Gill Force is on our left and we now follow the path to the bottom go over the footbridge in front of us and turn right and follow the track into Keld. After a break in the Well-being Garden we return to the footbridge at the bottom of East Gill Force. We do not go over the bridge but head forwards through the gate at a sign for Muker. We follow the track for a short way with the River Swale on our left and at the sign post “Kisdon Upper Force” we leave the track and take this path on the left down to the waterfall. We then walk a little further to the lower fall of Kisdon Force. We then make our way back up to the main track and turn left. We follow the track and at the next sign post we turn right for the Pennine Way, Thwaite and Muker. We head uphill and at the gap in the wall and a sign post we turn left onto the Pennine Way to Muker. We follow the path with the wall and the River Swale on our left. The path starts to go downhill and leads us to a barn and we walk to the right of it and keep following the track to the left between two walls and pass to the right of another barn. We come out onto a tarmac track and follow it down into Muker we can see down below. An easy to moderate walk with good tracks and some moderate inclines and declines. Approx 6.75 miles using OS map OL30 Yorkshire Dales – Northern and Central areas. Muker is in Swaledale in the Yorkshire Dales. There is a pay and display car park just on the edge of the village and free parking in the lay-bys next to Straw Beck at the other end of the village. From the A1 take the A66 at Scotch Corner and take the first left at the traffic lights onto the A6108 to Richmond. Go through Richmond staying on the A6108 and then take the B6270 to Reeth and staying on the B6270 pass through the small villages of Healaugh, Feetham, Low Row and Gunnerside. Muker is approx another 2.5 miles. There are public toilets in Muker with disabled facilities and also toilets at Keld. For refreshments in Muker there is a village store, a tea shop and a pub The Farmers Arms. In Keld there is a cafe and shop at Ruskins campsite and on the main road about five minutes walk from the village there is Keld Lodge a hotel bar and restaurant.